In our hotel you get more. Not only more friendliness and helpfulness, but also the extra service and comfort every traveler desires – no matter if private or on a business trip. But it is not just about the physical well-being and well-kept hotel rooms at the Boutique Hotel Donauwalzer – it is to be expected from us. It is rather little things that make a stay in our hotel in Vienna so comfortable. For example, a free smartphone in the room, a powerful Internet connection, a quiet leafy courtyard or a private spa exclusively for you. Feel right at home here. From check-in to departure! Even if it gets hot outside, we stay cool. Simply ask for a room with air conditioning. Such as our VIENNESE ORIGINALS, for instance. If you don’t want that, we will gladly provide you with a fan. Those bring cooling in high temperatures, without any impact on our environment. Alternatively, we also recommend our rooms of the category “Park”: they are located on the shadier side of the building and guarantee a completely quiet sleep even with open windows, despite the proximity to the city centre. There are parking places for two buses right before the hotel. They can be used all the time except during peak hours. If a bus has to stay longer it can park at AKH (within 5 minutes` walk from the Donauwalzer Hotel). Here you can go to the Vienna`s Bus Driver’s Guide with all relevant information you might need. Please note, that we cannot be held responsible for any parking tickets/fines. As a direct booker (through our webpage, by phone, via email or in person at the hotel) you enjoy constantly extending advantages, as for instance free late check-out, free early check-in, upon availability a free upgrade on a higher category or 10% discount on our souvenirs. And the price is always the cheapest at the source, of course. With the first shafts on sunlight our green inner courtyard with loungers is brought out of a winter sleep. The goldfish are coming into their pond. The fountain splashes till late autumn. Our guests usually meet there in the afternoon for a chat or a glass of Viennese wine. We can also reserve a Private Spa Area exclusively for you. A sauna, an IR-cabin, a whirlpool and loungers await you. To make it more exclusively you can book one of our whirlpool rooms with cuddly bathrobes and Nespresso coffee machine. There is a possibility to lend city bikes at the underground station U6 Alserstraße (one minute`s walk away). All you need for that is a valid credit or cash card. One hour is gratis. In case you arrive with your own bike, there is a specialized bike store in front of our hotel for any technical support. You can safely park your bikes in our inner courtyard for free. 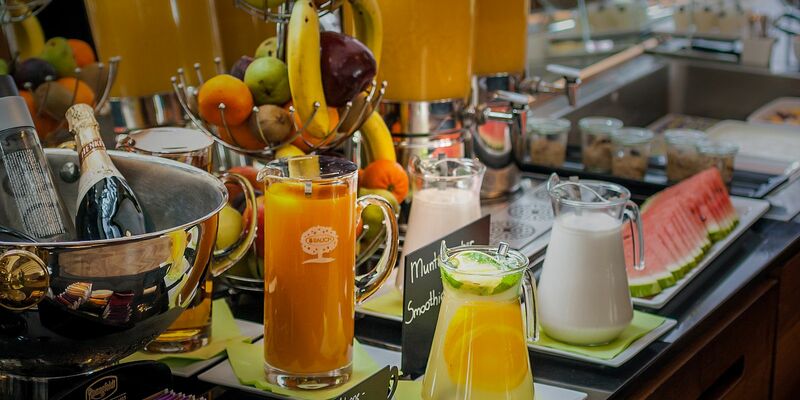 Our rich warm and cold buffet is thoroughly arranged every day and is well-known in the whole district. With our diverse egg dishes, fresh self-made waffles, hard- or soft-boiled eggs, daily fresh-baked cakes various kinds of spread, cereal, yoghurts and bread you will make a good start. Drink not too much ice-cooled sparkling wine though! You could blur your pictures. The breakfast is accompanied by gentle waltz music as you would expect of a Viennese hotel. On Sundays you have the opportunity to take part in our waltz course and try a few movements of this dance under the supervision of professional dancers. And to a Sunday belongs a Sunday breakfast! Therefore there is playing of flutes and fiddles every Sunday. Two professional musicians perform pieces like “Donauwalzer”, “A Rose from the South” or some famous parts from various operetta pieces. Listen and enjoy, we perform it regularly! For duration of your stay we will provide you with a smartphone free of charge. You can make phone calls at our expense, surf, send pictures or even let you guide yourself through the city with it. Please leave the mobile phone in the room after departure - if you take it with you, we will always know where you are. Do you really want that? 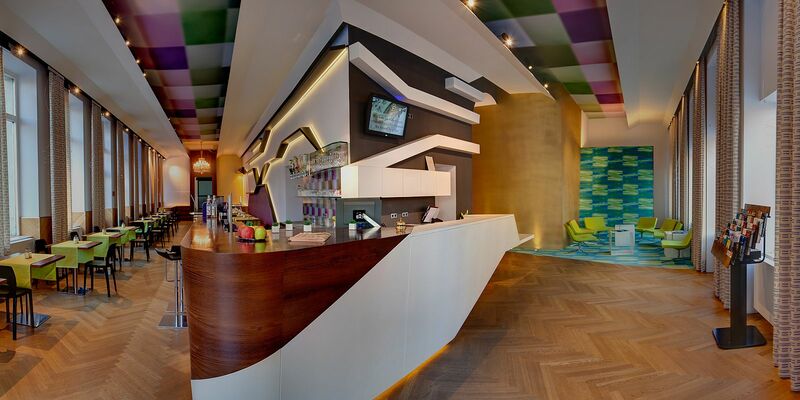 You can visit our bar day and night. A cup of Viennese coffee “Melange” or just a beer, perhaps? Let our stuff oblige you. But we have not just some beers, wines or provisions here. Ours are exclusively selected Viennese wines from wine-growing areas like Grinzing, Neustift am Walde, and Ottakringer beer from our district which is served at the hotel. Our mineral water (Vöslauer) and juices (Rauch) originate from Austrian companies. Children from the age of 7 get price reductions. Your plane is leaving later? You would like to enjoy Vienna till the sunset? Enquire after our late check out. Your baggage can be safely lodged at the reception for free. If you booked directly (through our website, by phone, by email or directly at the reception) you can keep your room longer free of charge (until noon). That's one of the many little "thank you" for your reservation. Direct booking pays off! Our hotel has two lifts at your disposal. One of them has a wonderful peace of wrought ironwork of a lattice in Jugendstil – a real gem and popular photo scene. This one goes to the 4th floor, the second one to the 5th. To get to our Roof Top Bar (in planning), there is another staircase on the 5th floor. You will love the view! We offer different ways of parking your car at the hotel. More information under Location. Please remember that we can not be held responsible for any penalties. Please always observe the internationally valid street signs. Even though the Boutique Donauwalzer Hotel is centrally situated you will have a restful sleep and enjoy the calmness in our rooms with a park view. Their windows look out on our inner courtyard and in higher floors on a large park. Please note, that some categories can be booked only on our website. Organizing of tours, tickets booking and searching for suitable tour guides will be carried out by us. If you would like to lock your laptop or other valuables we have at the reception free guest safes. Please note that the hotel assumes no liability for lost articles. In case you want to wash or iron your wardrobe, we are glad to do it for you. You have to leave early? Unfortunately we cannot take getting up off your shoulders but the wake-up service. There is also an alarm clock in your room. 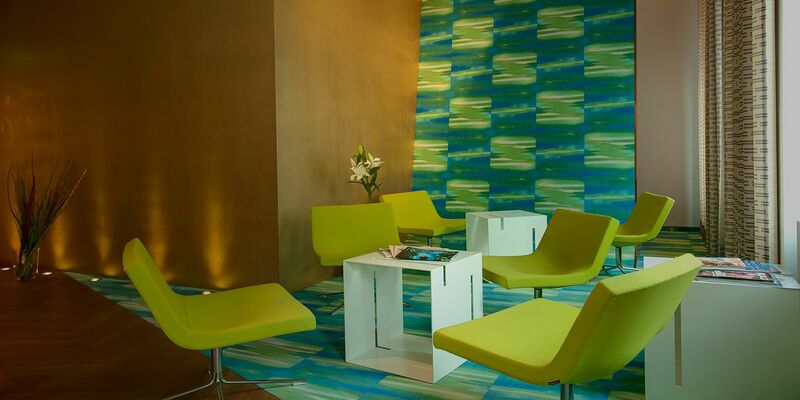 After a day full of impressions you can revive in our ample wellness oasis. Release your muscles in the sauna, relax in the IR booth or let air bubbles massage you. At our 24 hours reception you get Vienna Card for 24, 48 or 72 hours. It gives you various benefits. Moreover this card is a 24/4872 hour valid short-distance ticket for the public means of transportation. Certainly, a city map will be added to it. Additionally we recommend taking along the smartphone from your room – it has both city guide and GPS navigation available. You CANNOT use this card till Wien Schwechat airport! Let us advise you to take a taxi. You can order it at our friendly reception. What would a visit to Vienna be without a waltz? In order to make a good impression on the Viennese floor or later at home, you can easily learn the necessary dance steps with us. Weekly trial lessons take place under expert guidance for our guests at the Hotel Donauwalzer. Of course for free. Just ask at our reception. A dog run area is one block away. The Danube can be reached directly by the U6 if you want a long walk. If you arrive with dog, we have put together a whole VID package for you. VID? Very important dog. Detailed information about your stay with your four-legged friends with us can be found here. One more note: please do not be angry if we first greet the dog - we love dogs! And if you leave your dog at home: our Newfoundland Eos is ready to be petted at any time. A W-LAN network is available in the entire hotel. So you can comfortably work, surf and put your pictures online in your room. 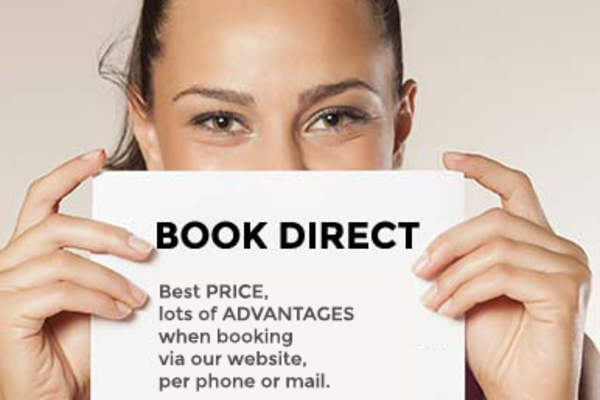 If you booked your room directly via hotel home page the unlimited usage is included. In case of booking through a travel agency, please ask our competent receptionists. High quality shoe polishing machines are available at the hotel at two different places for shining appearance. Or you give your shoes to our housekeepers for this purpose. Daily updated newspapers wait for you in the cafe every morning. You can find them both in the lounge and next to the 24 hours hotel bar.